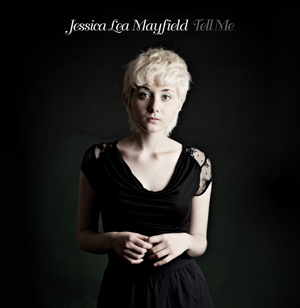 When I told some friends that I had fallen in love with Jessica Lea Mayfield’s latest work Tell Me, my announcement was met with concerned eyes. What’s wrong? Are you depressed? Are you feeling alright?—they asked. The material from which she draws is raw, honest and dark. She writes as the scariest type of depressive: one who is bright enough to see clearly the ways in which she self-destructs and acts anyway. Mayfield’s lackadaisical singing style can come off as emotionless, but only if she is explored solely from the surface. The beauty in Jessica Lea Mayfield’s style lies in its subtlety. The shifts in tone, both sonically and emotionally, are so slight and delicate. A minor inflection here, an off-color joke there. A barely-audible chuckle at the end of a lyric. If nothing else, Mayfield is an encouraging lesson in resilience. Yes, she sings of being heartbroken, fucked up and worse. But she continues to toss herself back into the fray because life is worth living. Life without these regrets and scars would be meaningless. Songs too, for that matter. Another thought worth considering is the fact that Mayfield is often the one doing the hurting and heartbreaking in these songs. Loving and leaving the sorry fools that never had a chance in the first place. Perhaps it’s disconcerting to hear a petite, fragile blonde chick so coldly dismissing old lovers. The humanity comes from the fact that she realizes the pain that she’s caused and continues to cause. She just can’t change her behavior, it’s ingrained within her. Like it or not, this is something a lot of us can relate to. I will admit that I am innately drawn to almost anything Dan Auerbach digs his grubby paws into. He serves as the producer on Tell Me for his fellow Ohio native. The album was released by The Black Keys label Nonesuch Records. Auerbach does a lovely job of allowing her songwriting to remain the driving force while adding textures and sounds that give the album a depth that it would otherwise lack.